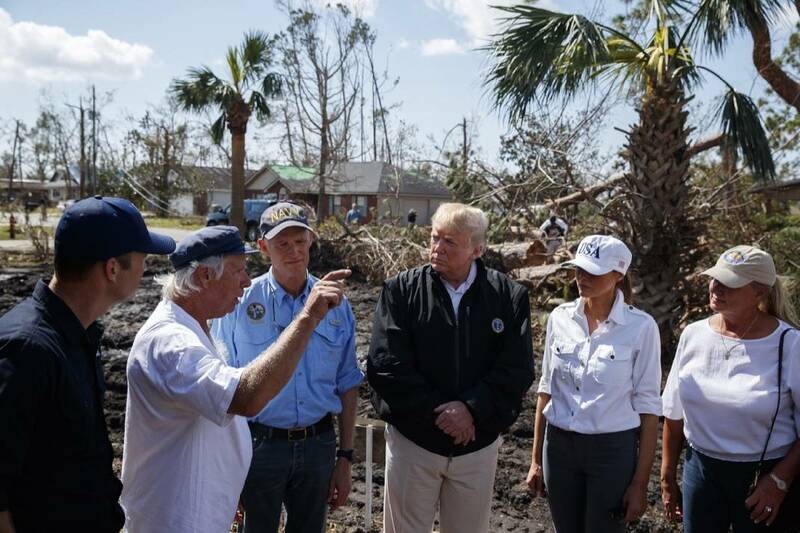 LYNN HAVEN, Fla. (AP) — Michael Rollins shook President Donald Trump's hand Monday at the front door of his hurricane-ravaged home in the Florida Panhandle, saying he decided to ride out the storm because he didn't have anywhere else to go. "I knew I had made my commitment to stay with my animals," Rollins told the president, standing by a massive pine tree down on the front lawn. "Somebody said it was like a very wide — extremely wide — tornado. ... Beyond any winds that they've seen," Trump said. "Look behind you. I mean, these massive trees are just ripped out of the earth. This is really incredible. This road — five hours ago, you couldn't ride on it." "Everything I've asked the president for, he's come through," said Scott, the Republican candidate for U.S. Senate. "We still have a lot of work to do. We're still getting water out, getting food out." Rollins was among many people in the Panhandle who rode out the storm. Kayla Runyon, 22, said she evacuated to a hotel in Callaway with some relatives. "We watched out the window and we just watched buildings be demolished," Runyon said. "Steel beams started coming through the hotel windows and through the walls. There were windows busting. We were scared. It was scary." At a farm in Macon, Kevin Rentz, a fourth-generation cotton and peanut farmer, told Trump he lost his entire cotton crop. Rentz said he's still digging up peanuts, but the problem is storing them without electricity. "You'll get it back," Trump told Rentz. Trump still had politics on his mind, despite the devastation he was about to see. Before leaving the White House, he tweeted about his rally crowds, claiming they are bigger than ever before, including during the 2016 election. "Never an empty seat in these large venues," he said. The president refused to cancel a campaign rally in Erie, Pennsylvania, last Wednesday — the day Michael struck the Panhandle — saying he couldn't disappoint the thousands of people who had been lining up for hours to see him. Trump also held rallies in Ohio and Kentucky before the Florida-Georgia visit.